Description: Challenging course set in three different terrains designed by local Eagle Scouts. 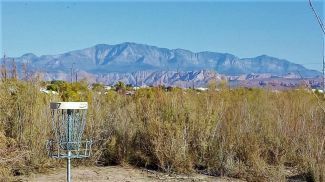 Some elevated tees and beach near the Virgin River. Note: Do not jump fences to retrieve any discs - please knock on door and ask for permission first. Local Directions: Take Exit 6 from 1-15 turn right on E. Riverside Drive. Follow appx 3 miles and turn right onto S. Mall Drive. Travel appx 1 mile, turn left onto S. Sandia Road. Take 2nd left onto Coletero Dr/W. Mariposa Drive. Take First Left onto S. Alveo Drive. Park is on left.